Written by: admin on June 18, 2013. On November 28, 2002 an all-terrain vehicle drove through the lobby of the Paradise Hotel in Mombasa, Kenya and exploded. The BBC reported that the terrorist attack killed at least 15 people. 9 of them were Kenyan and 2 were children. For most people, it was simply another tragic news story. For Roslyn Cunningham and her husband, the tragedy was personal. Richard Cunningham grew up in Msumarini, a small village in Eastern Kenya, just north of Mombasa. His father worked as a medical doctor there and in different parts of Kenya over a period of about 30 years, and Kenya became home. As the Cunningham children grew older and moved away, the house was sold and was remodeled as a hotel. “[My husband’s] old house was bombed and we reached out thinking ‘what can we do to help?’ ” said Roslyn Cunningham. Richard Cunningham still visited his hometown and even still knew some of the villagers. After a village gathering, the villagers decided what they really needed was a clinic, because the nearest one was miles away. The Cunninghams knew little about setting up a clinic and even less about charities. Fortunately, a lady in Mr. Cunningham’s office giving department suggested opening a Donor Advised Fund (DAF) with CAF America. With a DAF, the Cunninghams could support their charity without the large investment and time intensive process that setting up a 501(c)3 involves. They began with a simple goal: running the London Marathon to raise the initial funds they needed to buy land. 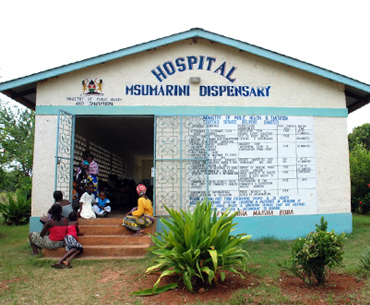 With the money they raised, in partnership with the Kenyan government, they bought land and built the Msumarini Welfare Clinic. Most significantly, they gave the ownership of both land and clinic to the village. Setting up Msumarini Welfare Trust and Clinic was only half the battle though. As the clinic has grown, the Cunninghams are discovering different needs they would also like to support. The doctors and nurses take care of patients with common diseases such as malaria and diarrhea. However, they are also coming to terms with bigger issues such as a high underage pregnancy rate and a lingering stigma for people living with HIV. Mr. and Mrs. Cunningham travel to Kenya with their two children at least once a year. “We get to see what they really need, what the building looks like,” Roslyn explained. “Little things that might be hard to explain over the phone. My husband also speaks Swahili, and he visits the local health administration.” They are also learning how to work in a different culture. The work is difficult, but for the Cunninghams it has also been a great opportunity and they are learning on the job. “It’s just rewarding seeing the pleasure on these kids’ faces,” said Roslyn. Photo provided by Roslyn Cunningham.